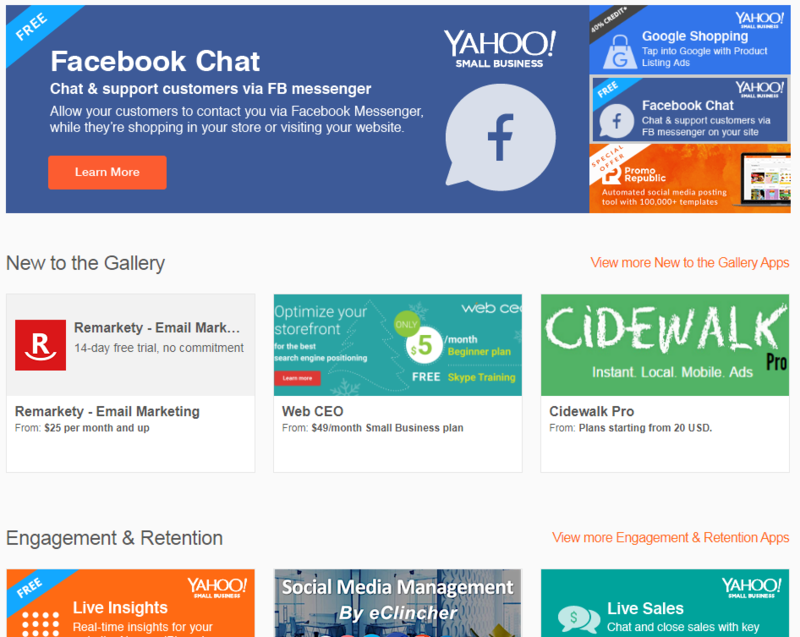 Yahoo Small Business has changed name to Yahoo Aabaco Small Business. It has an entire suite of products to offer those who wish to start their very own online store. 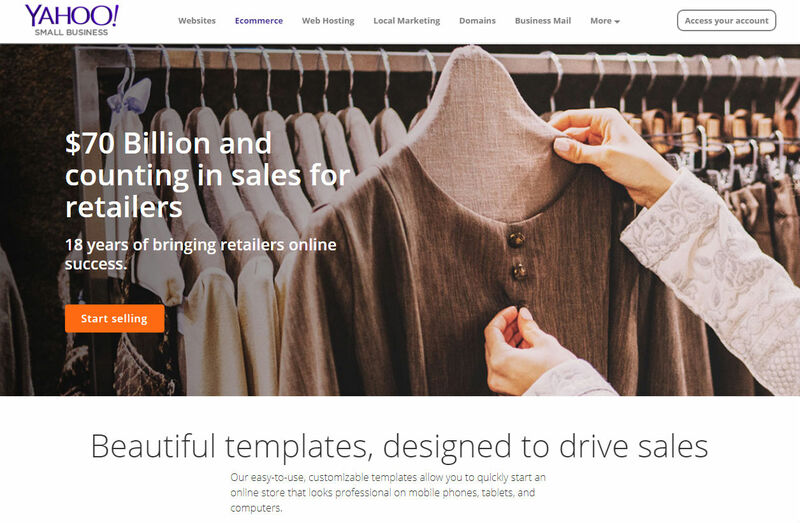 Ranging from hosting to domain registrar, business email to the company’s ecommerce shopping cart, Yahoo’s products come with quite a number of features. 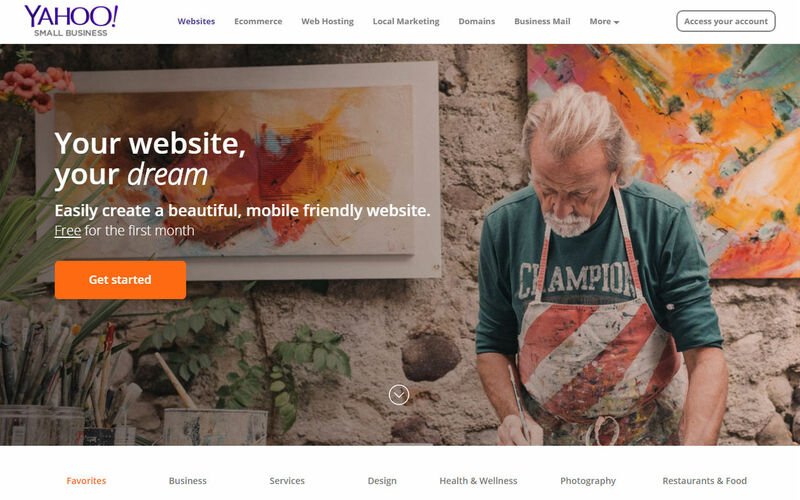 Recently in 2017, Yahoo just changed the branding from Aabaco Small Business back to Yahoo Small Business. O, Yeah! 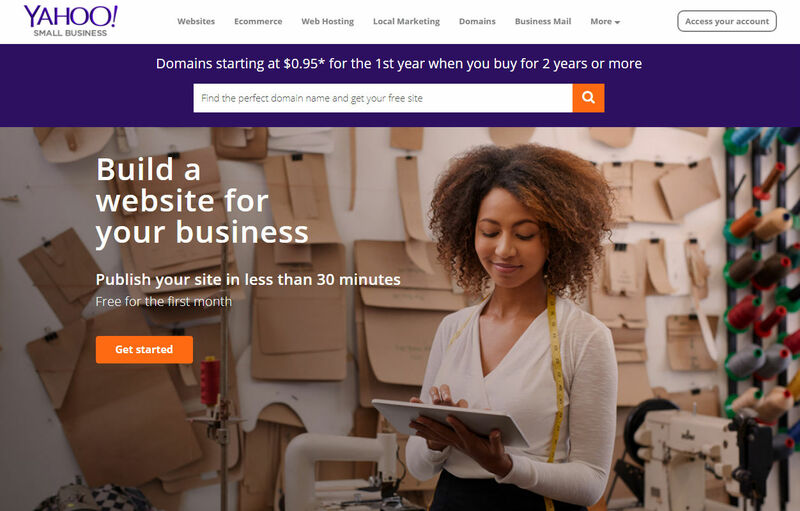 Yahoo Small Business offers quite a comprehensive package for new merchants and small business start ups. Domain name registration and business emails along with unlimited data transfer, disk space and email storage would help companies that have a lot of products to sell. With unlimited products across all plans, Yahoo ensures that merchants will have plenty to load up in their stores. O, No! No free trials offered. Transaction fees ranging from 0.75% – 1.5% awaits. Subscription price will increase after the 1st year. 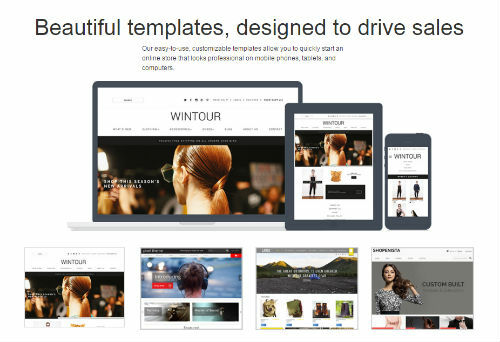 Templates and the overall look and presentation of the online shop may need some revamping to give it a more modern look focusing more on good quality product images. 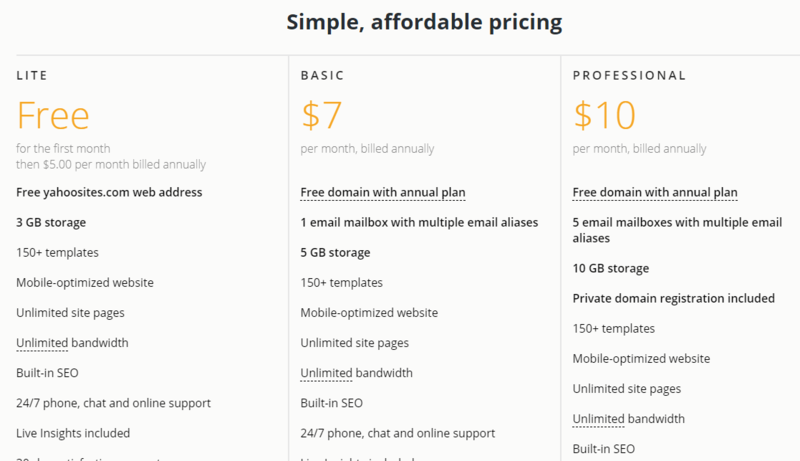 Prices range from $5/month – $10/month and comes with free domain, unlimited bandwidth and $100 credit for Search Marketing. 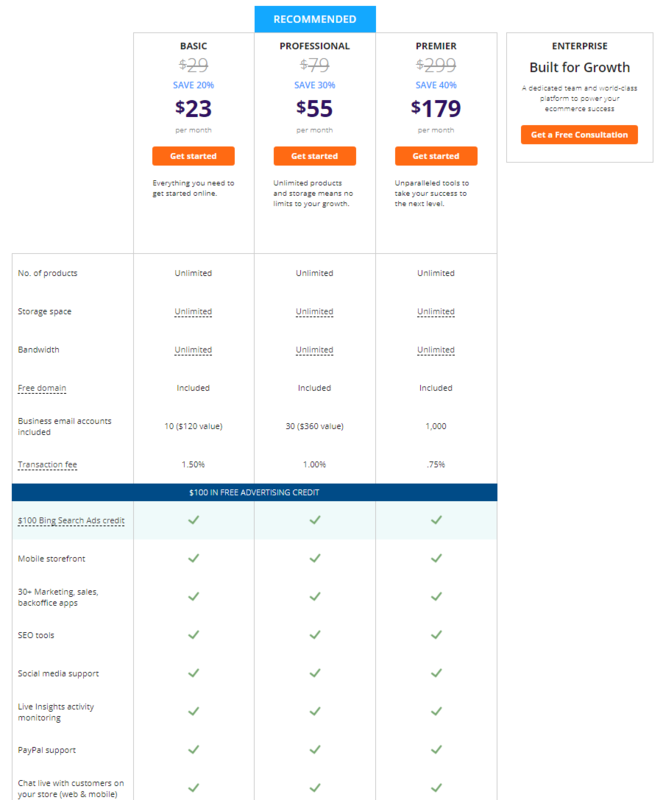 When it comes to pricing, Yahoo offers 3 different plans Basic, Professional and Premier. Based on the pricing, please note that merchants will be billed annually and not monthly. Important Note : Yahoo charges a transaction fee of 0.75% to 1.5% depending on which plan that you choose. Important Note : Another down side of it is that the company does not offer any free trial period for merchants to have a go at their ecommerce solution before signing up. So if you want to it try out, you will have to sign up for one of the monthly plans and decide whether you want to continue using Yahoo’s shopping cart or not. Those who are just starting out may want to try other shopping cart providers first particularly those that offer a free trial period so that you do not have to commit any payment until your store is ready. Depending on how long you will need to set up an online store, providers such as Shopify offer 14 days free trial while InstanteStore offers 15 days free. Pick one that suits your time frame needs. 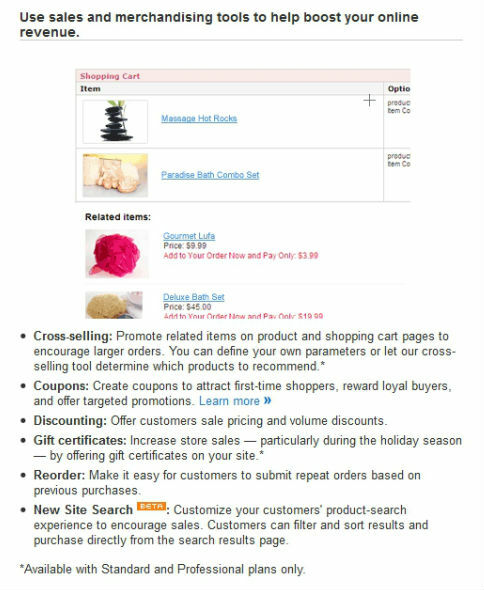 Yahoo has a range of ecommerce features that is listed on their website for merchants to read up on. What is commendable is the fact that they also include short demo videos on how to get it done and what it actually looks like for a few of the features. To set up the design of your store, just be guided by the wizard. Yahoo Merchant Solutions also allows customization with their built in editor. Yahoo has their collection of apps for merchants to pick from which is useful as you only use what you need. As with apps, some may be free while some youll have to pay. Please remember to factor into your budget for paid apps. 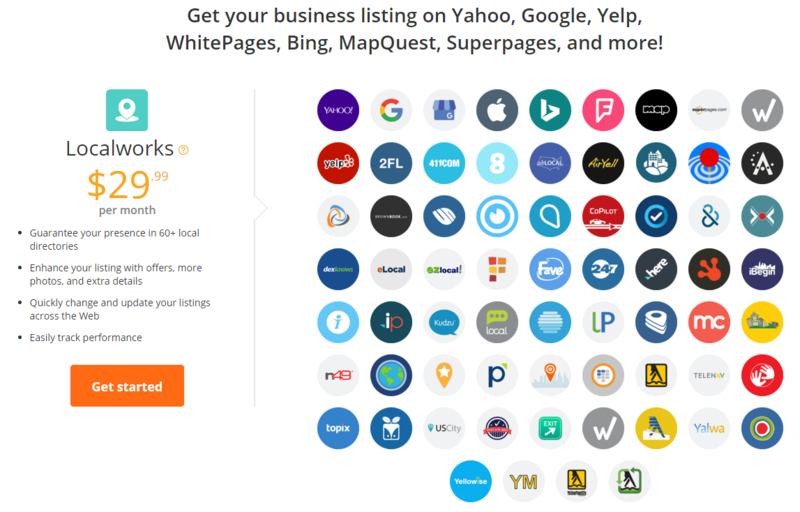 Local businesses who want a greater presence could make use of Yahoo Localworks which guarantees your presence in over 60 local directories. You’ll need to get your business verified by Yahoo first before being able to add more information like website, business hours, etc to the Yahoo Localworks. 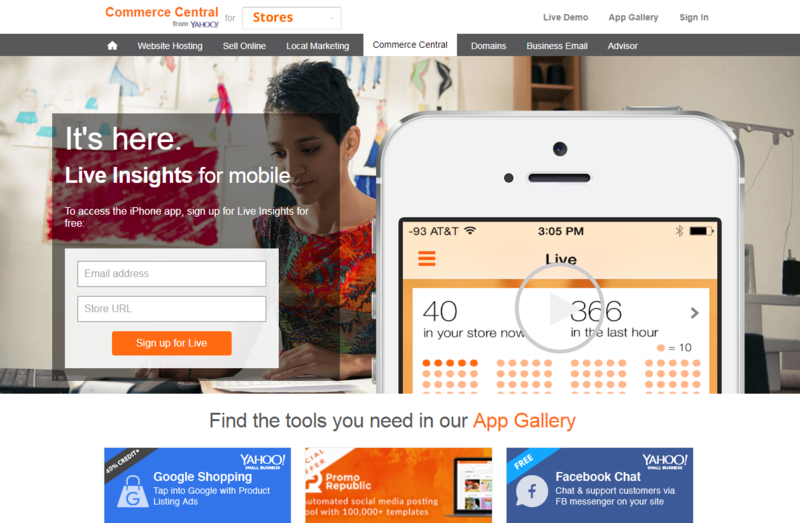 Now this I found impressive.. Now known as Commerce Central by Yahoo, Live Insights is an app that store owners can use to track how many visitors are in their store in real time. They even have the ability to chat with customers who are in their online store to see if they need any help or to answer simple questions on products. The app is FREE and not only limited to Yahoo Store merchants but will work with other stores that are using different shopping cart platforms like Shopify, Volusion, InstanteStore, BigCommerce, 3DCart, Magento, etc. Merchants can just download the app and set up their Live Web Insights easily. Just copy the code and have it pasted on your stores extra head tags section. 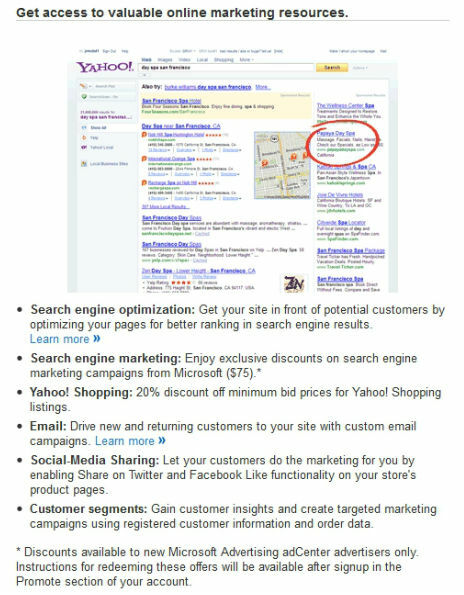 Once its verified, Yahoo Live Web Insights will be able to show you real time stats of whats happening in your store. For instance, you can see the total number of customers, number of page views, see which pages customers are visiting and what products they are buying and be able to initiate text chats with customers to see if they need any clarification or help on the products that they are browsing and provide recommendations. Merchants who sign up for any of the plans will be able to load up to a maximum of 50,000 products to sell. Just follow the Add Product Wizard and the system will automatically create your product pages. Bulk upload feature is available and the solution has real-time integration with external inventory management systems such as OrderMotion and StoneEdge. Note : Real time integration are only available for Professional and Premier plans. Theres a range of merchandising and promotional tools available for merchants to use promote their store. Single and multiple use coupons and discounts in the form of dollars, percentage and volume are also offered. Customers could easily re-order based on their order history. Note : Up-sell, Cross-sell and Gift Certificates are not available for Starter plans. Theyre only available for Standard and Professional plans. Merchants will be able to customize the checkout process. There’s even a tax setup wizard to guide merchants. Allow customers to purchase gift wrapping or include a personal message with their order if they are buying it as a gift for someone. Registered or guest checkout options are also available. 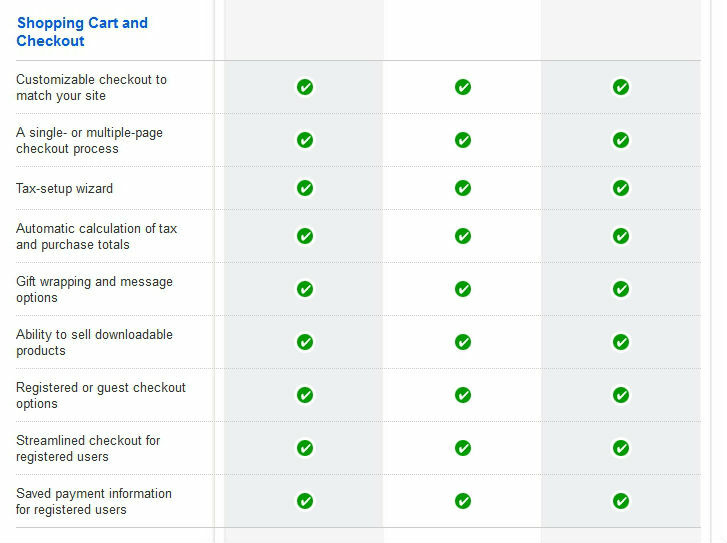 The rest of the checkout features are pretty standard for a complete shopping cart solution. 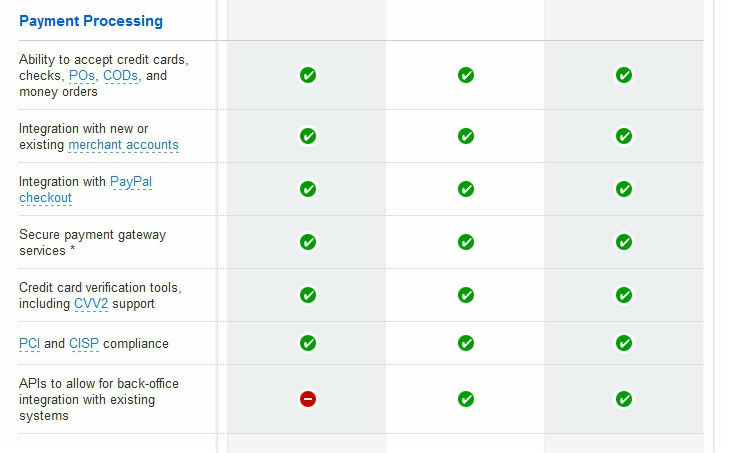 While Yahoo claims to accept online payment via credit cards, checks, etc and uses FDMS Nashville payment gateway platform, it will do well for the company to show the list of payment gateways that it is integrated with other than PayPal. Tip : This will at least help merchants who are non-USA businesses to see whether they could pick a payment gateway that is used in their country since theres no free trial period offered by Yahoo. Has all the basic order management features. However, UPS WorldShip integration is available only for Standard and Professional plans. It would help if Yahoo made this feature available to those who are on the Starter plans as well. 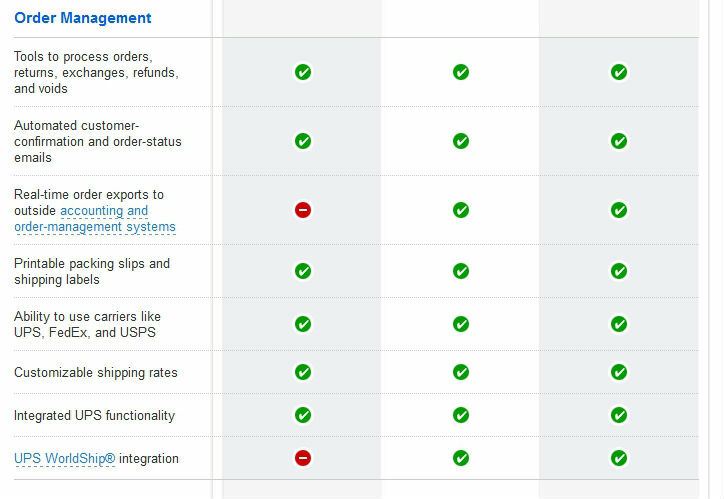 While the solution has UPS integrated and allows merchants to use FedEx or USPS, perhaps it would help to open for integration with other shipping companies from other countries like UK and Australia for non-US business. Yahoo has a tie up with Microsoft in terms of search engine marketing discounts valued at $75 (Microsoft Advertising adCenter credit). To top it off, merchants get to enjoy up to 20% discount off Yahoo Shopping bidding prices (in Yahoo! Shopping bid credit). Note : Only NEW advertisers are eligible to enjoy the discounts for Microsoft Advertising adCenter only. Merchants who wish to use Campaigners will receive the 1st month free thereafter followed by $10 per month to continue using them. Yahoo uses its own Yahoo Web Analytics to generate advanced and real time reporting for merchants. This feature however is only available for Standard and Professional plans only. Again, it would be great if Yahoo would make it available to those on Starter plans. Then again, those on Starter plans could opt to use Google Analytics if they do not wish to upgrade to the higher priced plans. The company guarantees an up time of 99.9% consistent up time for your store. Regardless of which plan you take, Yahoo offers up to 1000 email addresses and unlimited disk space, disk transfer and email storage which is pretty awesome for high usage merchants. Available 24 hours a day for both phone and email support without any charge. The company also has an online help center and those wanting to receive premium support need to have a minimum of $500,000 in annual online sales to qualify. Looks impressive but pricing is a bit steep compared to the other major players in the market. 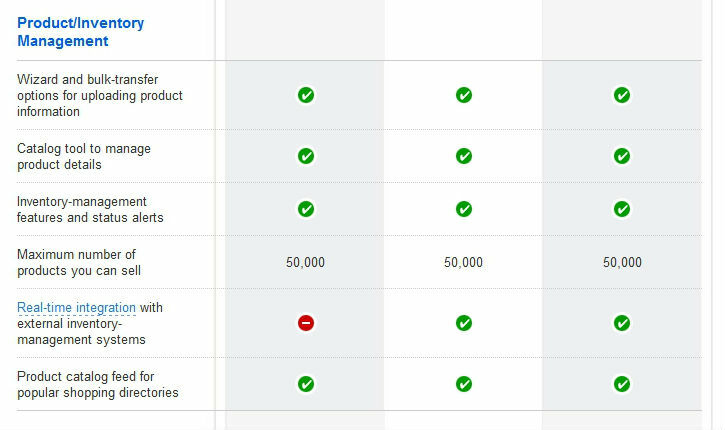 With the minimum rate that Yahoo is charging for their Starter plans, it would do the company well if they would offer all the other features that are enjoyed by those in the Standard and Professional plans. Also, if new merchants could try out their ecommerce solutions for a free trial period, that would be awesome.